Michael F. Brown (Of Counsel) – Schiffman Sheridan & Brown, P.C. Michael F. Brown serves the Central, PA community as a disability attorney. Harrisburg, PA residents come to his practice for the greatest expertise in disability law. He also focuses on Social Security, Veteran’s disability, and workers’ compensation claims. He provides services to claimants in Harrisburg, Hershey, Camp Hill, Carlisle, PA, and neighboring communities in central PA. In addition to an in-depth comprehension of legalities and regulations, claims involving disability call for an understanding of various aspects of the medical field, such as terms, practices, and procedures. Since 1976, disability lawyer, Michael Brown, has pursued a full understanding of security disability claims from both a legal and medical standpoint. Mr. Brown reviewed disability claims and provided advisory services to Administrative Law Judges as a social security disability lawyer. Since 1985, he has guided innumerable claimants in need of a social security disability lawyer to assist them in obtaining benefits under the Social Security Act. He has also provided legal representation for claimants under state and federal workers’ compensation programs, as well as the Railroad Retirement System. Mr. Brown is also an adept advocate for those seeking veterans’ disability, a widely neglected area of practice. To consistently improve his knowledge and capabilities as an SSDI attorney and SSI lawyer, Mr. Brown makes it a point to maintain and utilize a web of professional relationships. He’s an active member of the National Organization of Social Security Claimants’ Representatives, the American Association for Justice, the Maryland Bar Association, and the Workers’ Compensation Sections of the Pennsylvania and Dauphin County Bar Associations. On behalf of the Pennsylvania Bar Institute and numerous other groups, Mr. Brown regularly gives lectures focusing on various aspects of Social Security. He delivers presentations to members in support groups, coping with conditions such as cancer, multiple sclerosis, head trauma, systemic lupus, post-traumatic stress disorder, Agent Orange exposure, and neuromuscular diseases. Additionally, he contributes as an author of Social Security manuals for the Penn State Dickinson School of Law and the Pennsylvania Bar Institute. With extensive experience behind him, he teaches lawyers statewide about the many intricacies surrounding disability law. Mr. Brown is a 1973 graduate of Fordham University in New York. He earned his Juris Doctorate three years later from the Dickinson School of Law. Subsequently, he was awarded a Reginald Heber Smith Fellowship via Howard University, and worked as a staff attorney for Delaware County Legal Assistance from 1976-1977. Afterwards, he served as a senior lawyer in the Harrisburg Office of Disability Adjudication and Review for seven years. In 1985, Mr. Brown began his own private legal practice with Administrative Law Judge, Garth A. Stephenson, in Harrisburg. He and fellow attorneys, Lori K. Serratelli and Steven J. Schiffman, have practiced law together for over two decades, each bringing a unique set of skills to the table. Mr. Brown and his wife, Kristen, were previously officers of the central Pennsylvania chapter of the West Point Parents Club. They have four children together. He actively spends time within his community as a soccer, basketball, and softball coach. As a U.S. Soccer certified referee, Mr. Brown referees PIAA boys and girls soccer in the Mid-Penn Conference. 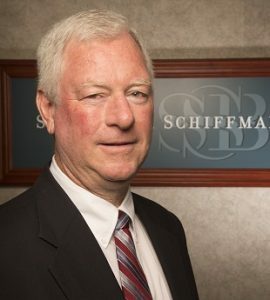 When it comes time to look for a disability attorney, Harrisburg, PA residents turn to Schiffman, Sheridan & Brown P.C. Email mbrown@ssbc-law.com today for more information or call 717-540-9170 to schedule an appointment with Michael F. Brown.